Cut the heads off the garlic bulbs (about 1/2") to expose the garlic inside. Arrange in a covered casserole and drizzle with olive oil. Bake at 400°F for 30-45 minutes, until garlic is tender and almost like a paste. Meanwhile, combine wine, butter and oregano in a small pot and bring to a simmer. Simmer for about 15 minutes. Once the garlic is finished, let it cool a bit, and then press the garlic 'paste' out of the bulbs by squishing with a spoon, or use your hands (it's messy). Add to the wine and butter mixture and heat to a simmar. Mash the garlic so it creates a sauce and cook until it is a bit thick. Cool this down in the refrigerator for a few hours. 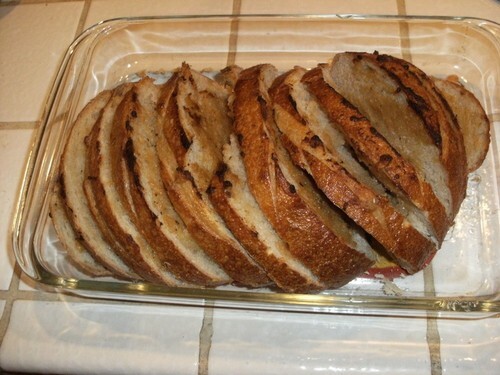 Slice your bread to desired thickness and arrange in a large glass pan. Spread the garlic spread on each slice of bread and then arrange it so it is sort of "fanned out" in the glass pan. Reserve about 1/4 cup of the spread and heat that up. Drizzle the heated spread over the bread once finished. Heat in a 375°Foven for 20 minutes or so, until bread is golden brown.